Mazda makes affordable and sporty vehicles that are ideal for a first car or a fifth car. The 2017 versions are nicer than ever before and showcase Mazda’s blend of comfort, technology, and affordability. Mazda has released a ton of exciting information about the new Mazda3. The 2017 Mazda3 has more standard features than ever, like G-Vectoring, an exclusive technology that “uses the engine to refine steering and handling to match the driver’s inputs, and enhanced sound insulation to complement Mazda3’s redesigned upscale interior.” The MSRP of the new Mazda3 is set to start at $17,845. The Mazda3 Sports model includes features like USB connections, Pandora, Mazda Connect, Bluetooth connectivity, remote keyless entry, push-button start, and a seven-inch touch-screen display. Mazda is reporting an EPA-estimated gas mileage of 30 mpg in the city and 41 mpg on the highway with the automatic transmission. The Mazda6 is larger than the Mazda3 and gives the space some people crave in their sedan. Starting with an MSRP of $22,995 for the Sport trim, you can get an estimated fuel economy of 26 mpg in the city and 35 mpg on the highway. It also comes with features like the Mazda Connect Infotainment System, a push button start, remote keyless entry with an “answer back” feature, seven-inch touch-screen display, an auxiliary audio jack, Bluetooth connectivity, a multifunction commander control, and so much more. The safety features help protect your vehicle from damage and include a rearview camera, dynamic stability control, and a traction control system. The Mazda CX-3 is a CUV that provides 146 horsepower using the 2.0-liter engine. It gets an estimated 29 mpg in the city and 35 mpg on the highway, and the Sports trim starts at an MSRP of $19,960. The CX-3 has plenty of technology features that any driver can love like the Mazda Connect system, commander control knob, and a six-speaker entertainment system. Last year, the CX-3 was even ranked as one of the top safety picks of 2016 by the Insurance Institute for Highway Safety. Some of the other technological features with the Sports trim are Bluetooth connectivity, 12-volt power outlet, E911 automatic emergency notification, and a seven-inch full touch-screen display. 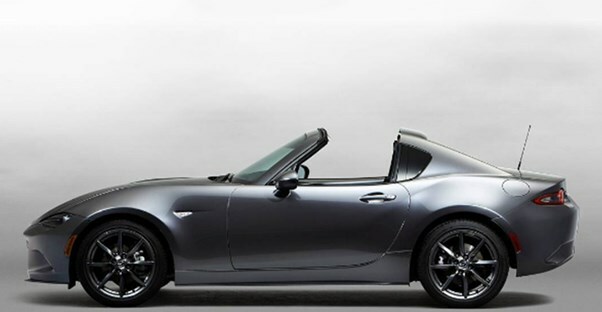 The Miata is an incredibly sleek sports car that has attracted luxury car fanatics all over the world. This year’s model is going to have a 2.0-liter 16-valve 4-cylinder engine with a six-speed Sport automatic transmission with paddle shifters. Even though this vehicle can be considered a “luxury” model, it still has a lower price tag than some others. The starting MSRP for the MX-5 Launch Edition is $33,850 for a manual and $34,925 for an automatic transmission. At the moment, it’s unknown if this is the price you’ll pay for the MX-5 Miata RF when it’s available for public sale. There are only 1,000 models available for the MX-5 Launch Edition, but for a $500 pre-order deposit, you can get a spot in line for the Miata. Car enthusiasts have been on the hook for weeks, but the Los Angeles Motor Show is almost here. With it will come the new CX-5 on November 16th, 2016. The teaser images have been released, which show that it’s the same size as the CX-3 but has a few changes on the front side. The new face is sporty, similar to the CX-9, and the rear has minor changes such as slimmer taillights and a possible addition of a chrome strip between the lights. We haven’t seen any images of the interior just yet, but some sources indicate that it will be equipped with 2.5-liter engine—the same engine in the CX-9. The CX-5 is looking sleek and powerful, but the full specs won't be released until the Los Angeles Motor Show.